Trying to eat local, seasonal food is a challenge. We don’t tend to read every single source label on produce at the grocery. One way to take a giant step is your local farmer’s market. Everything is guaranteed to be local, and lots is organic, and it is all always picked much closer to the time of your purchase than produce from any store. Herbs that I buy at the farmer’s market last for 2-3 weeks in the fridge, not 4 days like from the grocery store. Taste is hightened too. My favorite food fanatic, Jamie Oliver, has a featured story this week on Seasonal Eating on his web site. 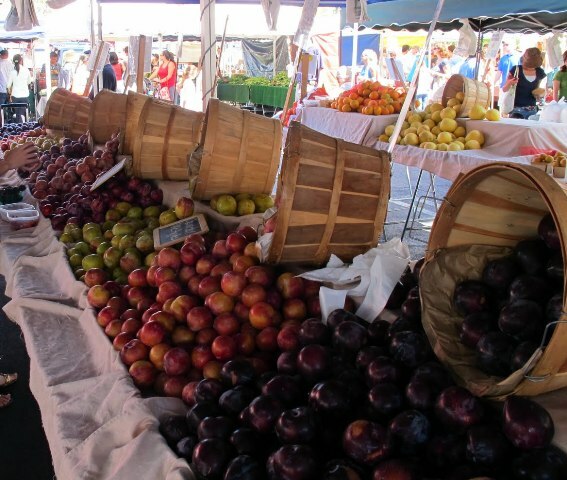 Look up your closest farmer’s market and especially in summer, eat seasonal and local! 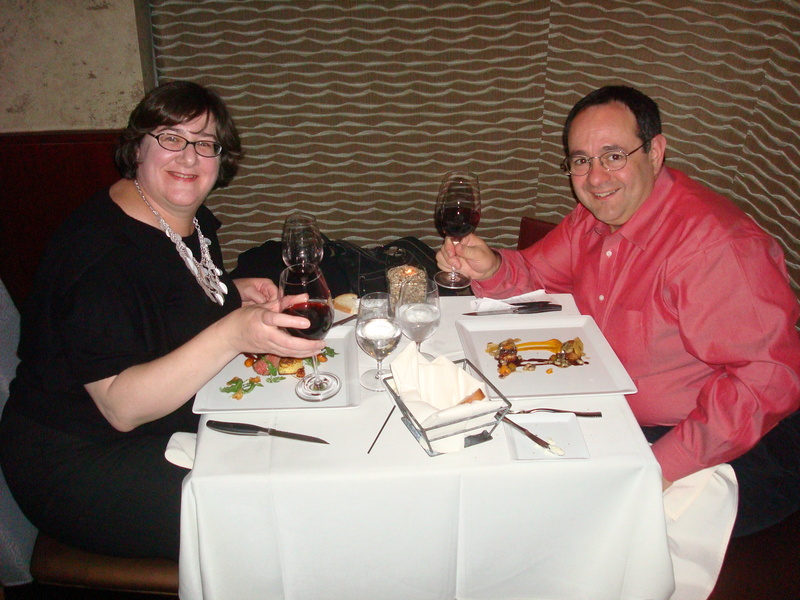 The week between Christmas and New Year’s we were in La Jolla, and had an incredible dinner at Nine-Ten in downtown La Jolla. 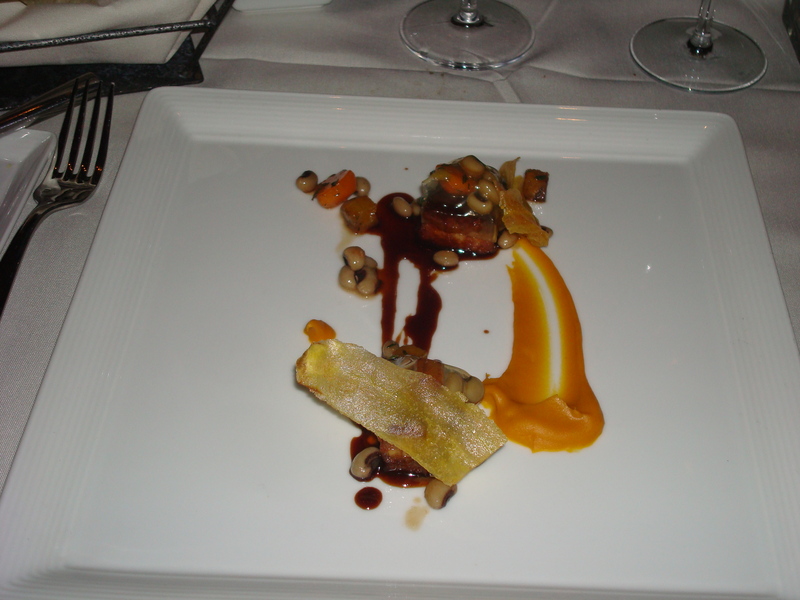 The “Mercy of the Chef” dinner is 5 courses that are each a surprise. When two people order this, each gets a different course, so you have 10 different items for dinner! 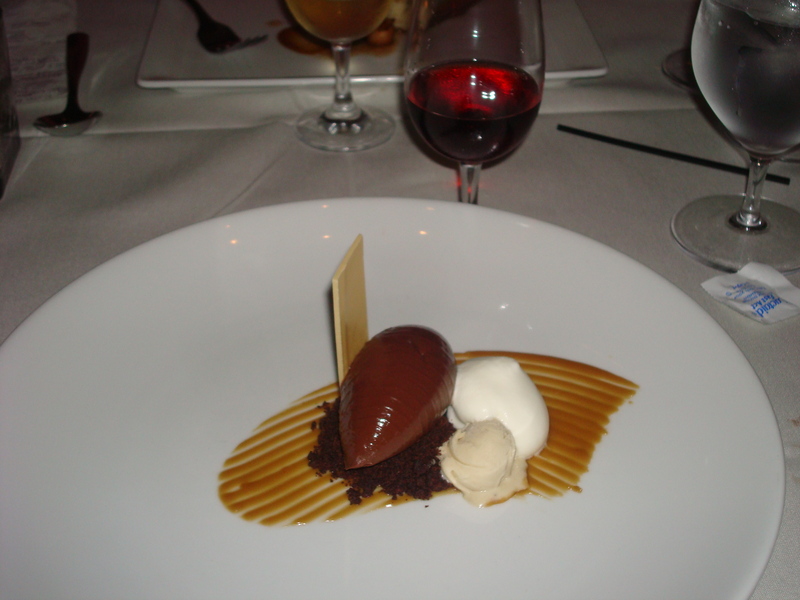 We ordered one wine pairing (to share) and they gave us half-glasses of different wines, so we tasted 10 wines too! It was all great. We would rate it a “10” – we found no flaws! We started with a drink at the bar they call a “Fraggle on the Rocks”. 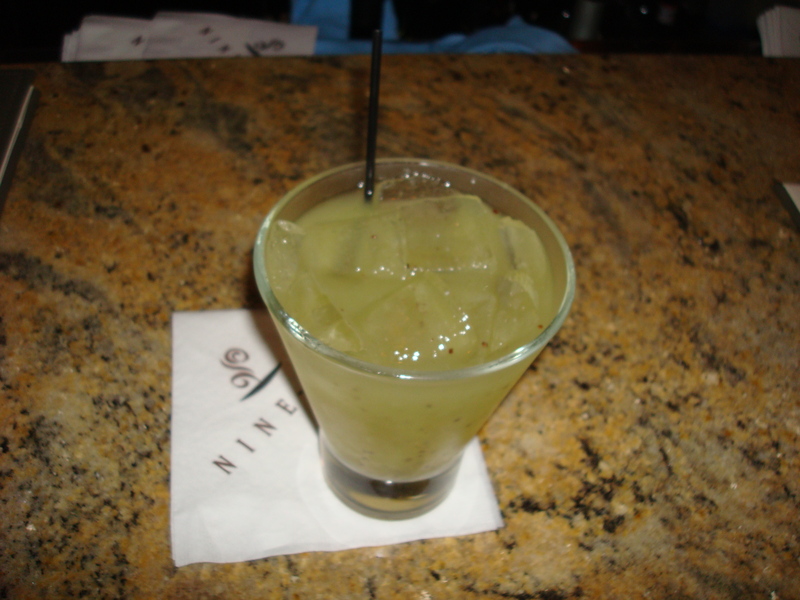 Grey Goose Citron, St. Germaine liqueur, Kiwi, Passion Fruit and Lemon. Yum and powerful. 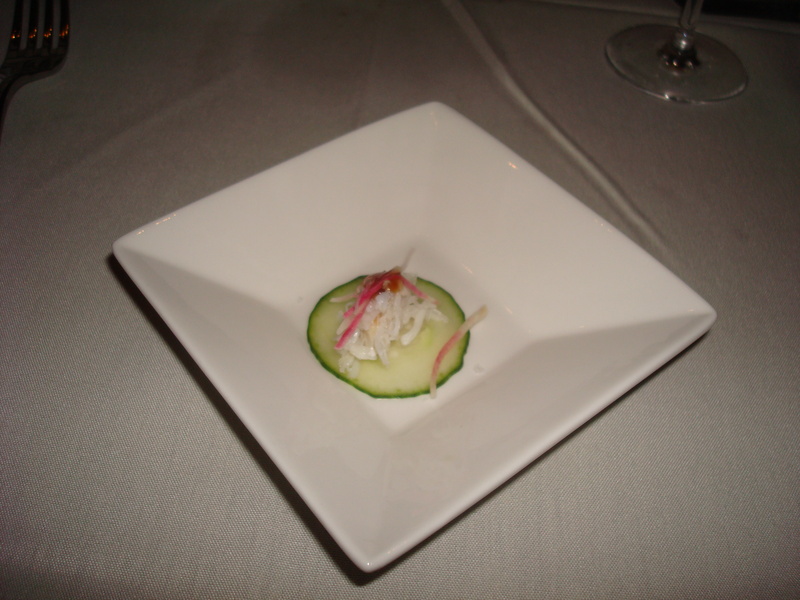 First courses: Oops – forgot the Amuse Bouche – Cucumber and crab with ponzu sauce and watermelon relish. 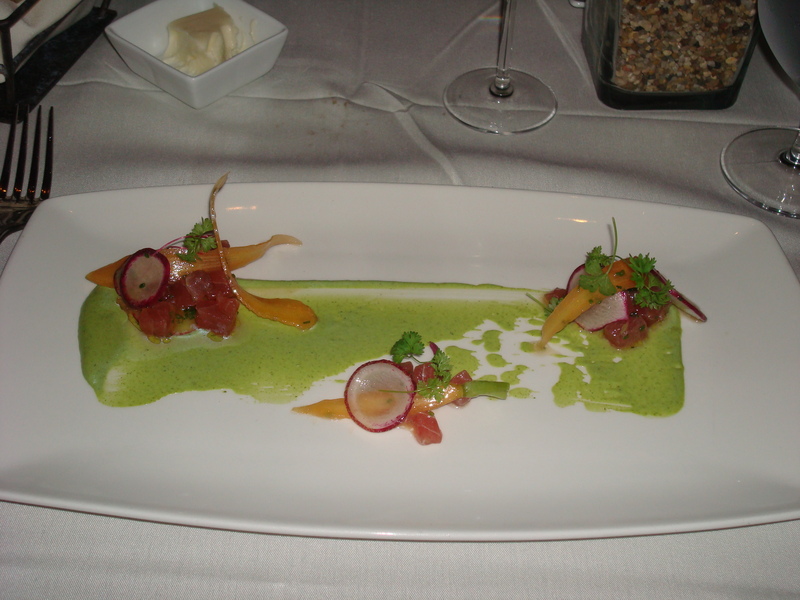 Then the real first courses: Tuna Tartare with carrot, radish, chervil, chives, and green goddess dressing, plus House Cured smoked salmon with potato salad, celery, apples, and salmon roe. Wines were Proseco Clara C Florio and Bouvet Sparkling Rose (Loire Valley). 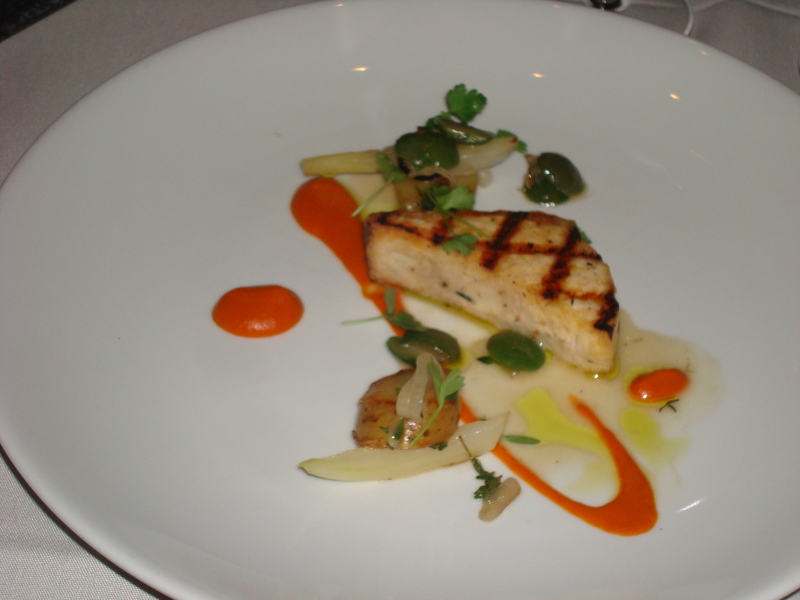 Second Course: Local Swordfish, with fennel, fingerling potatoes, olives, romesco sauce, served with Hess Su‘skol Vineyard Late Harvest Chardonnay (Napa – fabulous! 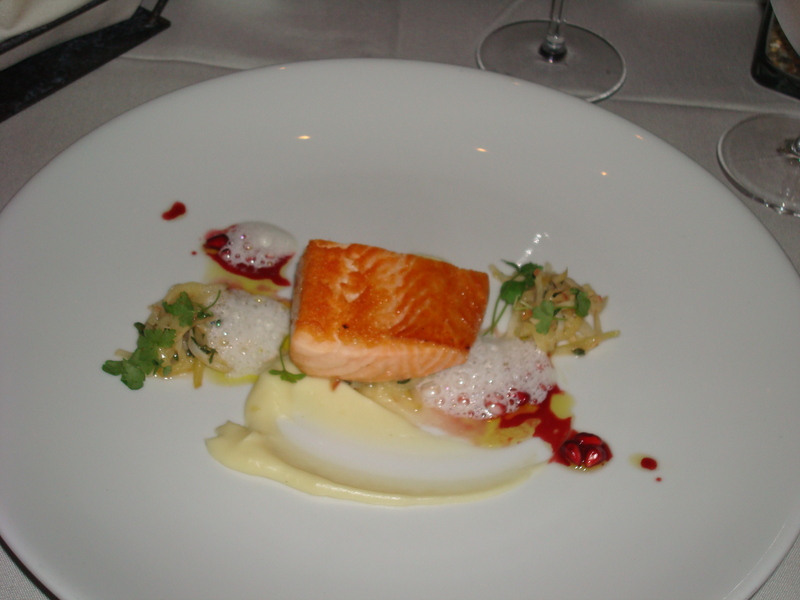 ), and Scottish Loch Duart Salmon, with celery root, apples, maitake mushrooms, parsnip puree, pomegranate and pepper froth, served with Talbot Logan Pinot Noir (Santa Lucia Highlands). 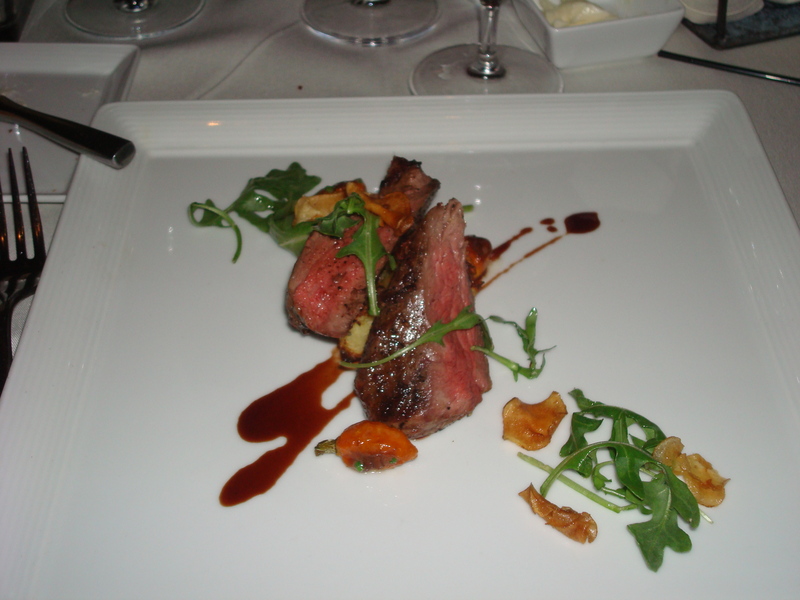 Third Course: Grilled Prime “Cap” Ribeye Steak, arugula and sunchoke salad, leek bread pudding (incredible), red wine emulsion, served with Epiphany Gypsy Red Blend AND Jamaican Jerk Pork Belly (a house specialty of the Jamaican chef), with baby carrots, Swiss chard, plantains, black-eyed peas , spicy jellies and sweet potato puree (eye-roll good), served with Curtis Central Coast Mourvedre (best wine of the night, IMHO). Fourth Course: Cheeses: Manchego (Spain) and Beemster Goats Milk (Netherlands) with Royal Tokaji (Hungary) and Taylor Flatgate Port. 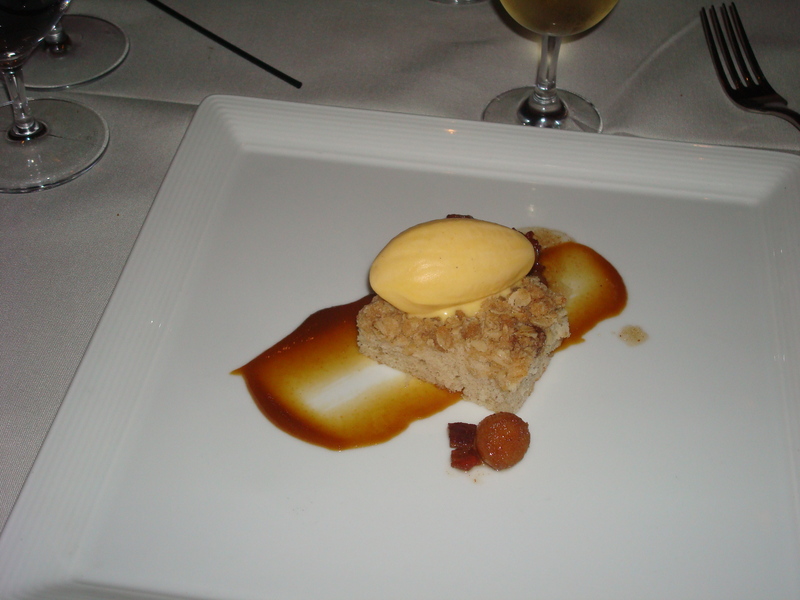 Fifth Course: Spiced Crumb Cake with caramelized bacon, quince, and butternut ice cream, served with Banfi Rosa Regale Sparkling Red Wine; and Chocolate Cream (72% chocolate) with banana gelato, butterscotch and ginger mousse, served with Chateau Graves Sauternes. What an incredible meal. I think a bargain, at $70 each, plus $30 for one wine tasting that got us 10 half glasses of wine! We met a nice couple from Redondo Beach, who make a special trip to the Grande Colonial Hotel (which houses the restaurant) and stay overnight just to eat in this restaurant. 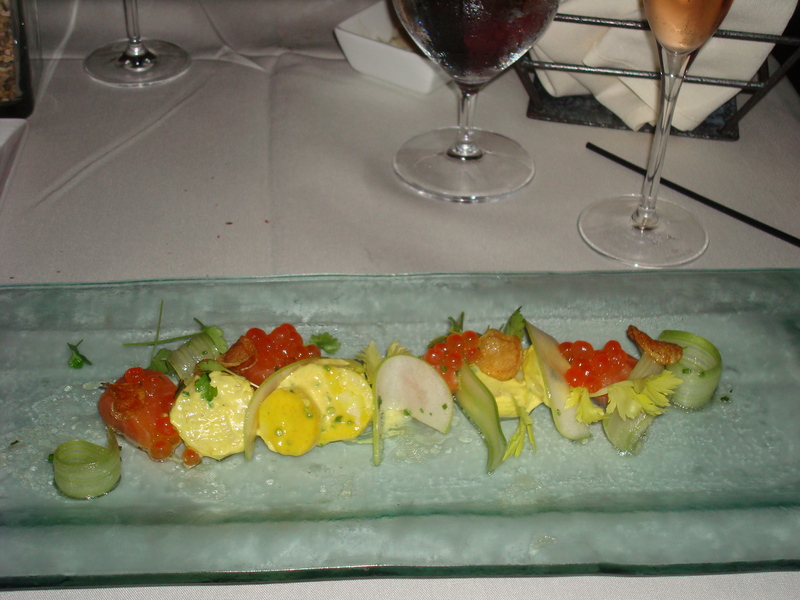 We would come back to La Jolla (oh, we would anyway) just for a dinner here too. Our server Danielle, was terrific. She’s been there 6 years, loves her work, and it shows!